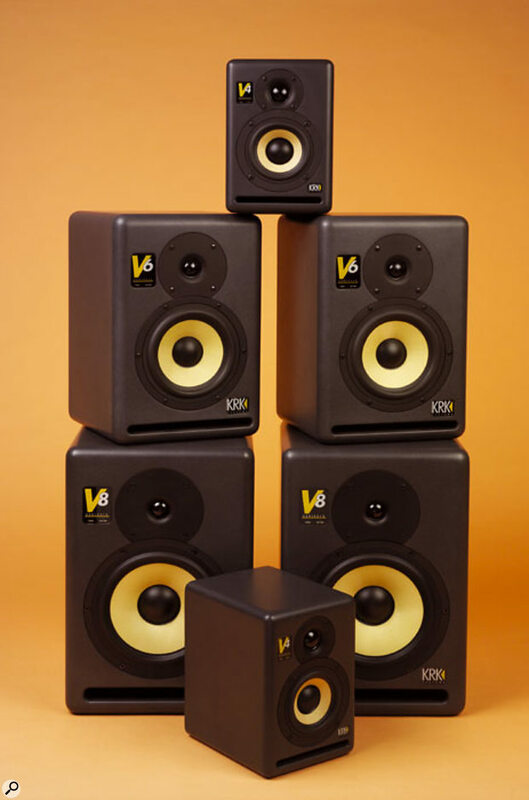 KRK's well-known V Series has been overhauled, making these active monitors even more tempting for the home-studio owner. KRK's monitors always look distinctive, and this new range is no exception, incorporating beautifully smooth cabinets, radiused corners, and yellow woven-Kevlar cones. There are three models, the V4, V6, and V8, where the number denotes the bass/mid-range driver size in inches. (A matching V12S subwoofer is also manufactured, but wasn't available for review.) Kevlar is used as the cone material because of its strength and good self damping, which reduces resonances and minimises the effect of the cone breakup modes. Radiusing the cabinet edges reduces diffraction, which in turn helps the stereo imaging, and the slot-shaped ports are designed to minimise turbulence, which can cause distortion. 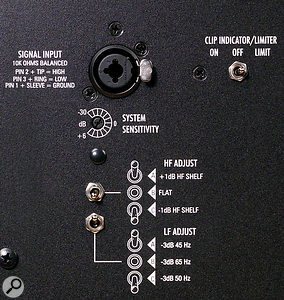 These monitors have very solid MDF cabinets with internal bracing, and in addition to the usual active crossover there's also a subsonic filter to roll off frequencies below the port's cutoff frequency. No details of the crossover frequencies were available in the manual, though the design uses a 12dB/octave filter, which is a little more genteel than many active speaker designers settle on. All the models are bi-amplified and feature low-resonance, ported cabinets, while driver protection is afforded by means of a built-in limiter, though this may be bypassed if preferred. All three models use a one-inch, soft-dome tweeter, and little amplifier detail other than the nominal power ratings is given, but then what actually matters, assuming everything else is up to scratch, is the maximum SPL and the frequency response of each model. The V4 amplifiers are rated at 15W HF and 30W LF, the V6 30W HF and 60W LF, and the V8 60W HF and 120W LF. Interestingly, the designers state their belief that a smooth frequency response, both on and off axis, is more important than a flatter response that may not be smooth — a view many serious speaker designers would endorse. Even the diminutive V4 manages a 62Hz-20kHz response ±2dB, while the mid-size V6 offers 55Hz-20kHz ±2dB. The much larger V8 covers 42Hz-20kHz ±2dB, and the maximum SPLs of the three models are 102dB (106dB peak), 106dB (109dB peak) and 109dB (111dB peak) respectively. To get an idea of how different these speakers are in size, the cabinets measure 23.6 x 15.9 x 19.7cm (V4), 35.6 x 23.8 x 25.4cm (V6), and 42.4 x 27.9 x 30.5cm (V8). Overall weight is 5kg, 11kg, and 16kg per speaker. All three have combi jack/XLR inputs with a level control (+6dB to -30dB range), but only the V8 has HF and LF adjustment via a pair of three-position switches. 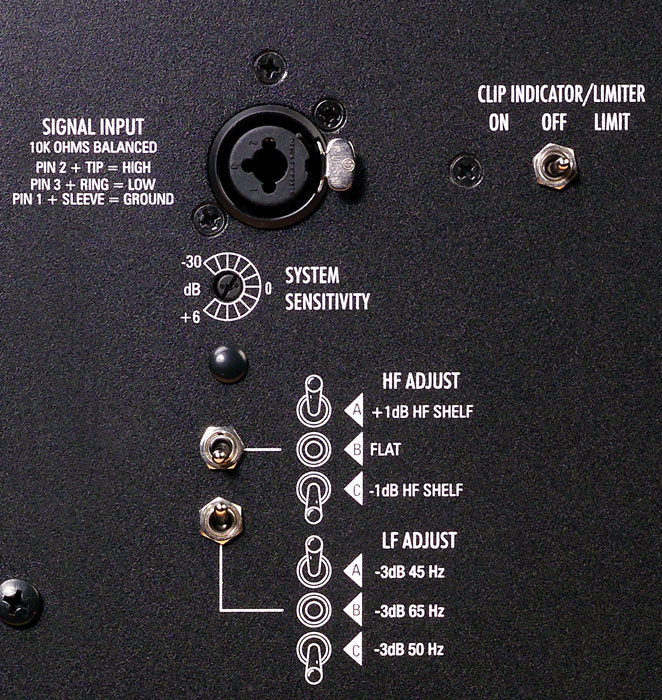 The high-frequency adjustment can be set to +1dB, flat, or -1dB (shelving above 1kHz), whereas the low-frequency switch sets the -3dB point to be at 42Hz, 50Hz or 65Hz. I checked out the little V4s first and, frankly, I was amazed at the size and depth of the sound, given that they are only 10 inches tall. You need to use them at moderate levels to avoid hitting the limiter or triggering the clip LED, but the sound is solid, articulate, and not at all boxy. They don't have the bass depth of their larger counterparts, but they still deliver a decent punch at the low end and, provided that you're working fairly close to them, they work really well. Although the larger models are better for accurate monitoring, the V4s are most definitely a cut above other small-format desktop speakers, and they seem to behave well in smaller rooms where bigger monitors might stir up trouble at the low end. By contrast, the V6s are proper 'grown up' nearfield monitors and deliver a more-than-acceptable level for nearfield or project-studio work. They have a smooth, extended bass end, great stereo imaging, and they present detail well, though I feel they emphasise the high end just a little more than a neutral speaker should. This gives them a subjectively tight, well-focused sound that is especially good for scrutinising individual elements within a mix, although, as with all monitors, the subjective sound will change depending on what room you use them in. Certainly these are fine for doing discerning mixes, provided that you get used to the sound with known good material first, but compared to my Mackie HR824's, I found them quite forward sounding. The V8s are the big guns of the range, and have the benefit of those frequency tailoring controls for fine-tuning the sound to the room. The bass end goes slightly deeper than that of the V6s and there's a few more decibels of level available, but other than that they have a similar family sound. Even with the -1dB HF switch engaged, I still felt them to be somewhat forward sounding, but then I know a lot of people who like their monitors to sound this way, so it's really a matter of taste. Aside from the impression of exaggerated brightness, the tonal balance works nicely across the audio range, with a tight, well-defined bass end and spot-on stereo imaging. This new V Series is very nicely designed and built, with a family sound that's essentially consistent across the range. All the models have the same top-end emphasis, but the sound is still acceptably smooth courtesy of the soft-dome tweeters employed. The choice of woven Kevlar gives a solid, very well-controlled sound both in the mid-range and at the bass end, and either the V6s or V8s would work fine in a typical project studio. Where space is a problem, or where you need compact but accurate desktop monitors for a workstation, then the V4s will take a lot of beating in their size range. Although they might not go loud enough for the more enthusiastic user, they are still very loud and uncoloured for their size. KRK have established themselves as builders of serious studio monitors which, while not always cheap, are always sensibly priced for what you get. As you may have gathered from this review, my feeling is that they are voiced in what might best be described as an American way, which should appeal to the JBL/Genelec/NS10 school of monitoring, but will probably appeal less to the ATC/AVI/PMC school of users. These new models combine classic KRK styling and build quality with a consistent family sound, so if you need an active monitor and you want something with a slightly 'in your face' sound, there should be something in this range to suit just about any size of home or project studio. May be too bright sounding for some users. KRK's V Series 2 speakers have similar voicings to their predecessors, and uphold the company's reputation for value and quality. V4, £415 per pair; V6, £579 per pair, V8, £839 per pair; V12S subwoofer, £599 each. Prices include VAT.